Upon entering the store you'll be wondering which section you should check out first. There are so many great brands to be found here that you can't find in just any store. The co-founders, Luke and Sean, have a great vision, where they set up each section to look like a magazine spread that pays homage to each brand, and the unique story behind it. They have an entire wall of rubber ducks lined up and there is a little game to find which duck is facing the wrong direction (I am embarrassed to tell you how long it took me to spot the left facing duck!). Can you spot the duck next time you're there? TownPool is also home the Boston's largest indoor mini golf course! Be sure to try and get a few hole-in-ones when you stop in to do all of your shopping! Up first for the guys in your life is Southern Tide! This is a company that makes everything from polos and button-down shirts to vests and jackets, the quality of which cannot be beat. Seriously, the shirts are incredibly well made and super soft! You could knock off all of the guys on your list with this brand alone. General Knot has one of the coolest concepts behind the brand! So, if you're going to go the cliche dad gift route and get him a tie, why not have a cool story to tell as he opens it?! Each of these ties and bowties are made from vintage furniture fabric. 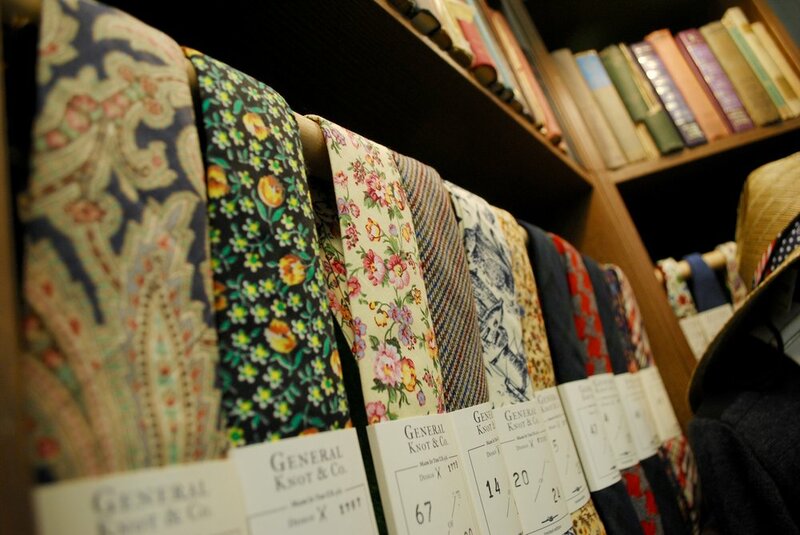 Since the fabric is vintage, there are only a certain number that are made from each print. Hence, the numbers on the tags. As you can see, some of these are among only a handful of others that look alike! Holebrook makes amazing sweaters that are sure to be a crowd pleaser! These sweaters are lined with a material that makes them windproof. You will be hard pressed, I am sure, to find a sweater warmer than this one! Happy Socks put a fun twist on men's work wear. These printed socks make the perfect stocking stuffer for the young professionals in your life- the enthusiastic and the begrudging alike! Also, if your dad is as quirky as mine can be (which all dads are), these socks make a great addition to the tie you pick out from above! Get a fun, unique gift for any of the guys in your life with these Harding Lane belts! All of these belts are made with genuine leather and are hand stitched. They come in so many different designs, that you can focus on picking one out that is truly specialized for those people who are special to you! Now on to the stuff I am much better at...gifts for all of the women you have to shop for! I absolutely fell in love with Sail to Sable when I found it in the store. This brand has some amazing classic pieces that can be added to any woman's wardrobe. The jacket pictured really stood out to me because of its timeless look. The black and white tweed with the gold buttons would make for the perfect gift for mom; classic, but fun! For those of us that have some cold winter months ahead of us, STIK makes the coziest hats, head wraps, and scarves! Made from Peruvian merino wool, these pieces are so soft, and incredibly warm. Not to mention, they are really cute! What could be better than staying warm, but also being fashionable?! How about supporting a local Boston brand? The woman behind this company is local to my neighborhood of South Boston. Be sure to pick up one of these head wraps pictured for all of the ladies on your list! GiGi is a brand of bags, wallets, and clutches that I have been a fan of for a long time. These genuine leather bags are great quality at even better price point! Their beautiful purses and clutches would make a wonderful gift for a sister. They also have smaller pieces, like wallets and tassel keychains, which would be perfect for that secret santa you're doing with your group of girlfriends! Looking for that small gift to give that little something extra for someone? Look no further than Lemon & Line! These bracelets make the perfect stocking stuffer, and with their price point, you could grab one for all of the ladies on your list. As an added bonus, they also come in kids sizes! While you are out doing all of your Christmas shopping, don't forget to treat yourself to a little something as well. After all, you'll need something to wear to all of those holiday parties that are filling up your calendar! This Driscoll NY was gorgeous on, and unbelievably comfortable. I actually did not want to take it off! One of the great things about the selection of items at TownPool, is that some of their pieces can be gifted to both guys and gals! One brand that I loved was Beach People! Maybe it is just because I am a typical twenty-something still trying to get my life together, but I seem to never have beach towels come summer time. This isn't just me either, as it seems to be a trend among many of my friends, who all inevitably end up sitting on their bath towels at the beach. Anyway, the towels offered up by Beach People are all incredibly soft, and come in amazing prints, that anyone on your Christmas list would be happy to get one! I saved one of my absolute favorites for (almost) last! Res Ipsa is a brand focused on providing handmade travel leisure goods. They have everything from shoes, to coasters and keychains, to weekender bags. I must say though, that the shoes are at the top of my list. Every piece they make is made from Turkish rugs, so each piece seems to have its own flare and identity. If you have that one person on your list who is impossible to shop for because they seem to have everything, then Res Ipsa just may be the answer! Whether you'll be gifting to a guy or a girl, these shoes make the right kind of statement! Harding Lane has more than just men's belts. The brand also has an awesome collection of baseball caps with the same hand stitching you will find on their belts! I know men are the obvious choice of gender to buy a baseball hat for, but sometimes ladies like them just as much! These hats are an easy and thoughtful gift for a variety of people on your list! At TownPool there is a great section of stuff for any of the kiddies on your list as well! There is the most adorable section of clothes for the most fashionable of toddlers. I mean...look at the owl hat and dalmatian booties below! You can check out all of the clothes online, but you'll have to head to the store for some of the accessories. Mixed in among all of the kids clothes are a bunch of fun little toys and games as well! The little kid in me couldn't keep myself from playing with some of them! If you make it into the store, these are the perfect stocking stuffers for any little ones you may know. EZPZ makes place mats with personality for kids. This gift is obviously meant to be used by the kids, but I am sure that parents will probably like them even more than their kids will! One of the best things about these mats is that when they are placed on a flat surface, it is very difficult for kids to move them. Thus, there will be less of a mess, hopefully making life a little more EZPZ! I wanted to give a huge shoutout to all of the lovely folks over at TownPool for letting me pretty much hijack their store! Also, a big thank you to my ever amazing photographer, Emily, and our talented male model, Andy! Everything you see here is in part responsible to each of those people :). Happy shopping everyone! Be sure to check out TownPool and comment below to let me know what your favorite brands/pieces are!